This new musical comedy, direct from Broadway, boasts a stellar all star cast including Natalie Casey (Two Pints of Lager and a Packet of Crisps, Legally Blonde the Musical), Bonnie Langford (Chicago, Spamalot, Cats), Jackie Clune (Billy Elliot, Mamma Mia!) and Amy Lennox (Legally Blonde the Musical, The Sound of Music) and is based on the hit movie and centres on three office workers who turn the tables on their sexist, egotistical, lying, bigot of a boss. They conspire to take control of the company and learn there's nothing they can't do - even in a man's world. Outrageous, thought-provoking and even a little romantic, Dolly Parton - 9 to 5 The Musical is about teaming up and taking care of business. Fiesty, fun and oh so fabulous! 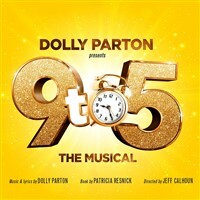 This show features Dolly Parton's original hit title song, 9 to 5 which won her an Oscar nomination and 4 Grammy Award nominations along with her new Tony® and Grammy nominated score. These 18 original numbers that mix Broadway and pop with Dolly's signature witty lyrics will have you kicking up your heels. Leave your daily grind behind and join in on the fun.